The New Mastersounds bring their retro-soul jams to the 4 Peaks Music Festival at Stevenson Ranch this weekend. 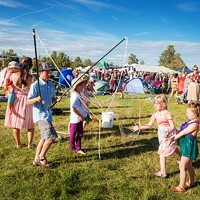 With an incredible forecast on the horizon, there may be no better place to spend the weekend in Central Oregon than at the 4 Peaks Music Festival at Stevenson Ranch. The festival brings together local, regional and nationally touring musicians, also delivering activities for kids, yoga and an after-hours silent disco. We listened to many of the bands set to perform at 4 Peaks and selected a few of our favorites. Check out these bands, spanning the musical spectrum from indie folk to funky retro-soul. Ehrenstrom grew up in Sisters, where he participated in the Americana Project during high school. Since then, Ehrenstrom and his band have been creating singer songwriter-focused indie folk-rock. Odds are you'll find Ehrenstrom decked out in plaid, playing guitar and singing sweet melodies. Later, you may very well find yourself scrambling to find his album on Spotify so your can listen again on the ride home. This band came together in 1996 when brothers Luther (guitar and vocals) and Cody Dickinson (drums, piano, synth bass, programming and vocals) joined forces to create a southern rock and blues band. The band's latest album, "Prayer for Peace," reached #1 on the Billboard Blues Albums Chart. This summer, Oregon native Nahko is touring in support of a new album, "My Name is Bear," from Red Rocks to 4 Peaks to Austria and Spain.. The Mother Hips have been around since 1991 and since then have developed a large West Coast fan base. The band plays earthy rock and roll that borders on pop and jam music. The rockers released their 10th album, "Chorus," in early June, and have an energetic and exhilarating sound to share. Thinking 4 Peaks only appeals to those with a soft spot for bluegrass? The New Mastersounds will break all of your preconceived notions about the festival when they bring their retro soul, funk and jazz jams to Stevenson Ranch. The British band plays raw and powerful music that will no doubt have you moving all night. The Brothers Comatose have been a Bend favorite for many years, and for good reason. The brothers blend rock, country and bluegrass to create a relatable and dance-worthy sound. The band returns to Bend with a new LP in tow. "Ink, Dust & Luck" features a new duet with singer Nicki Bluhm, who you may remember from one of their biggest hits, "Morning Time."